Since the Kindle Fire is an Android device, there is a way to install the OverDrive Media Console to download ePub books from your local library. Of course, there are now Kindle downloads available in OverDrive, and you would pick those first. But sometimes the title is only available in ePub format or the Kindle copy is out. On the Fire, you will need to do two things first. Go to the Amazon Android store and download AndroXplorer, which allows you to browse the file structure on your Kindle Fire. Click on the Android option to download, and look right below the box for the link that states "If your device does not support Android Market, you can download OverDrive Media Console for Android from OverDrive." (Screenshot on left.) Click on that link. Accept the licensing terms and you will see a short pop-up stating "downloading application". You will not be able to see the application in your Kindle Fire App menu yet. Add your library to the OverDrive app, and you can visit your public library's OverDrive site and download Adobe ePub books. If you do not have an Adobe account, you will be prompted to create one within the OverDrive app when necessary. OverDrive shows up in your App menu, now, too! Well, I took some time and worked with a friend's Kindle Fire and was actually quite impressed. While I was presenting in New Hampshire, I went out and purchased one. I am really impressed with the device. Is it an "iPad replacement" for me? Absolutely not. The iPad borders on being a laptop replacement with its larger screen and thousands of apps that can do most anything! The Kindle Fire is an Amazon device that delivers their movies, music in the Amazon Cloud, and, of course, their eBooks, in a small tablet form factor. The screen is responsive, the tablet is speedy, and it fits easily into one hand for holding. With this size (7.5" x 4.7" x .5") one can actually put it in a purse or deep jacket pocket for carrying around. The battery life seemed to last a long time, although I did not watch any videos in full yet...just tried out the Amazon Prime customer list of free flicks! Since I am not a regular Android user, I fumbled around a bit with navigation to the non-Amazon and Web stuff, but am slowly learning. There are few buttons and icons to pick, so, once I got over that, I was fine! I can search the Amazon App Store by title of app, but not all applications in the regular Android Marketplace are available for the Kindle Fire. The only one I really miss not having is the Sling Player Mobile app, but perhaps it will come. The interesting thing is, when searching, one sees the titles that are available in the Android Marketplace when typing the search term, but they are not listed as downloadable. It is quite a downer to see the app on the list, but then not be able to download it for the Kindle. I still prefer reading my books on the e-ink Kindle Touch, and reading on the Fire is not unlike reading with the iPad and iPhone Kindle app. It's okay for short periods of time, or when you are in the dark, but the e-ink is much kinder on the eyes. 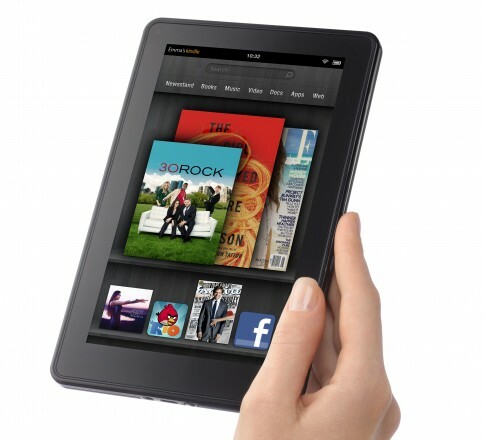 For someone who does not have a tablet, the Kindle Fire, at $199, is a nice device to get you started. Of course, at the big box tech store where I purchased it, I was answering all types of questions and concerns from shoppers-- it is just something I do this time of year when shoppers have that dazed and confused look on their face.